Kasey Brown and Marc J. Franklin in the world premiere of Thank You for Waiting. Photo by Ellen Bryan. BOTTOM LINE: A poignant and elegantly written new play about the complicated changes and questions that arise after a group of friends lose one of their own. Small talk turns to deep wounds in Marc J. Franklin and Kasey Brown’s Thank You for Waiting, an engaging new play featured in this year’s Frigid Festival. Franklin and Brown, whose intimate drama plays nicely in the Kraine Theater, also act in their show as reconnected friends Eddie and Kate. “Friends” might be a loose term, depending on who you’re asking, as Thank You for Waiting explores the complex dynamic that shifts after Eddie and Kate cope with the loss of their mutual best friend, Josh. Kate, new to and friendless in the Big Apple, makes an appointment at the therapist’s office where Eddie is doing his graduate school residency. As the therapist is out for the day, the waiting room becomes a crucible for Kate’s manic grieving and Eddie’s repressed emotions. 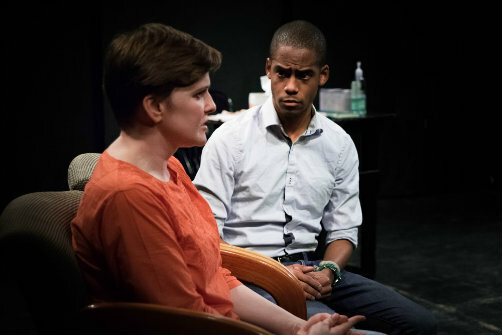 In a play where the I’m-grieivng-more-than-you conflict can encourage actors to outdo each other, it is refreshing to see Brown and Franklin play so wonderfully and naturally off of each other, and director Nicholas Foster keeps the staging minimal but active enough that the characters are as kinetic as their knotted feelings. Running at just under an hour, Foster also keeps the pace breezy and the pauses deliberate. As Kate, Brown never overplays her character’s OCD—a byproduct of Kate’s grief and guilt for her friend’s death—but instead walks the fine line between genuine and cartoonish without ever crossing it. Her monologue about mistakenly seeing Josh on the subway is particularly moving. And as Eddie, Franklin builds a strong foil to Kate, effectively showing his character’s more internalized approach to loss. The script features realistic and, for the most part, original dialogue, with humor sprinkled in to help lighten an otherwise heavy play. For such a short show, however, certain plot points are left undercooked; Kate often says to Eddie, “You were my best friend,” but the history of their relationship is a bit ambiguous and confusing considering how much they quarrel. The climactic argument becomes repetitive, with feelings previously dissected resurfacing again, but Brown and Franklin still approach each line with fresh energy. Thank You for Waiting is a world premiere, and a strong one at that. It is an effective meditation on death and the unseen depths in which people process and unearth grief, haunting its audience with the question: Can a personal loss be felt communally? Thank You for Waiting is by Kasey Brown and Marc J. Franklin. Directed by Nicholas Foster. Lighting Design is by John Delfino. Stage Manager is Nzinga Williams. The cast is Kasey Brown and Marc J. Franklin.